To have room for growth, current height should be at least 6cm under the maximum height for the size e.g. 6/7 (122) current height should be below 116cm. To celebrate the long awaited release of The Hobbit: An Unexpected Journey, this Christmas Day Sportech NZ is giving away a genuine football shirt from the English Premier League* to one lucky winner. Personalise these Football Legends' diaries by integrating ANY NAME of your choice into the pictures of some of your club’s most famous football legends. These A5 Football Legends’diaries can be further personalised with the recipient's name printed on the first page, together with a personal message. See your chosen name integrated into the photos in these stunning Personalised Calendars. Personalise the front cover with the recipient's name and a message. 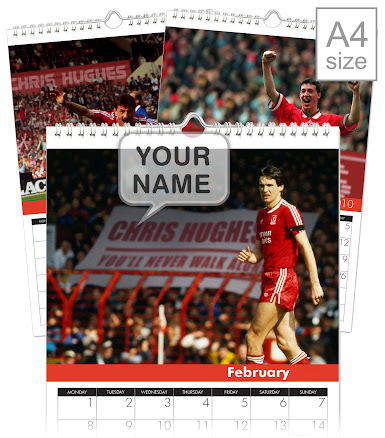 Wide range of these personalised ‘Name - in –Image’ calendars are available for 60 British clubs. Legends calendars with your name in 12 images are also available as desktop calendars and diaries. These are a perfect gift for any soccer mad supporter. The 2012/13 Manchester United kit by Nike was a radical design but has proved to be very popular. Order your personalised shirt / jersey early to avoid disappointment. Popular sizes can be sold out by early November.